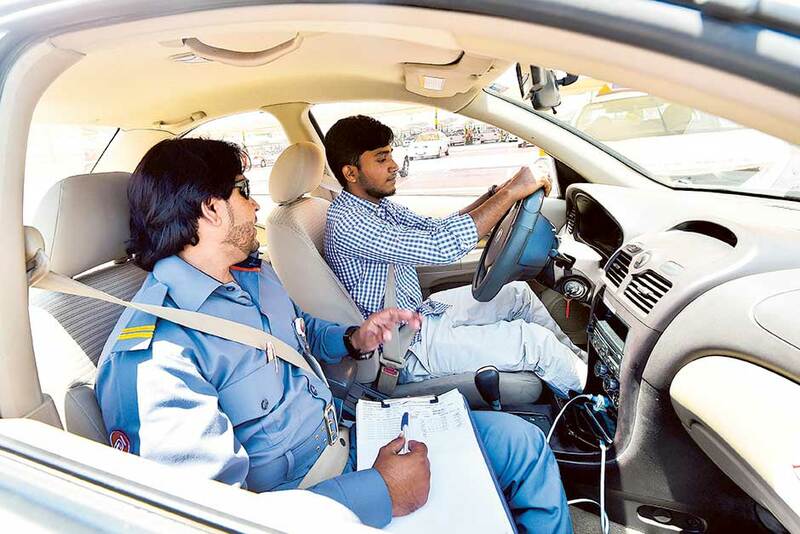 Dubai: Trainee drivers will now have their every move monitored with the Roads and Transport Authority’s (RTA) centralised training system (CTS) that is currently being rolled out across all the driving schools in Dubai. The RTA introduced the system early this year as part of it continuous upgrade of the training programme, helping improve efficiency of the system, while bringing in greater transparency for students and accountability for trainers. “The centralised training system uses digital tablets in the training vehicles to keep track of training sessions and upgrade the training experience for both instructor and students. The project has already been implemented and is being rolled out at driving institutes,” said Abdullah Yousuf Al Ali, CEO, the RTA’s Licensing Agency, in an exclusive interview with Gulf News. As part of the upgrade, apart from being equipped with digital tablets, the vehicles are fitted with a central processing unit that helps the RTA to monitor every move of the vehicle as well as keeping track of the training activities. We are working very closely with all licensing entities in other emirates to discuss and standardise the framework of training and drivers testing to ensure the highest level of safety for all drivers availing UAE licences. In the next stages, the training vehicles will also be equipped with internal and external cameras as well as sensors. The move takes the RTA’s Smart Yard system forward, where a series of cameras and sensors monitors the trainee’s moves during the yard test, without any human intervention. According to Khalid Javed, Training and Technical Consultant, Emirates Driving Institute (EDI), the CTS helps keep a log of the trainee’s activities, including what each candidate is learning daily and what progress he or she is making, with the RTA having direct access to the system. “CTS is a solution introduced by RTA to integrate all driving institutes in Dubai under one system to ensure that they are compatible with RTA standards on training and licensing field, which would help improve the quality of services to the customers,” said Javed. He added that the system ensures accuracy of information provided, while limiting the risk of losing track of training activities and services. Al Ali said that the RTA’s continuous enhancement of the driving programme will soon see grading or ranking of the driving schools, which will help schools improve quality of service, while trainees get better value for money. “The partner relationship management scheme (grading system) is built based on four main pillars, core service delivery, customer journey, compliance and passing rates. These main pillars consist of more than 30 quantitative and qualitative KPIs. The official policy is under final revision by the concerned departments within RTA and shall be approved and announced soon,” said Al Ali. number of those who passed the driving test, including many of those who started training in 2017. With the RTA being among the advocates of a federal unified driver training system as a means to standardising the driving culture and improving road safety, Al Ali said the proposal is being discussed at various levels. “We are working very closely with all licensing entities in other emirates to discuss and standardise the framework of training and drivers testing to ensure the highest level of safety for all drivers availing UAE licences,” said Al Ali. As the demand for driving licences continues to increase with more than 100,000 passing out of driving schools in Dubai alone, the RTA is planning to open four new schools by next year, one each in Al Qusais and Dubai South and two in Al Ruwayah area. Dubai currently has 16 training centres managed by seven driving schools. The RTA’s Licensing Agency is working on a digital transformation project which will digitise all driver licensing services through various channels like website, mobile application and smart kiosk eliminating the need for printed documents from the customers as part of Dubai Paperless Strategy. The transformation will begin with a live online opening of the ‘Learning File’ in the third quarter of this year, while complete digital transformation is expected to happen by early 2020.